Salerno was one of the bloodier, more critical operations of the Second World War. For a time the action hung in the balance as strong enemy counterattacks smashed and threatened the very existence of the initial beachhead. But at the last a gallant defense held firm and Salerno was won. This was the opening struggle of the long and bitter Italian campaign. On their first combat mission, 36th Division troops under the command of Maj. Gen. Fred L. Walker became the first American division to invade the European mainland and test Hitler's continental fortress. 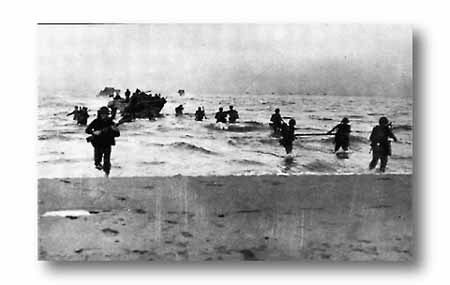 Before dawn of Thursday morning, September 9, 1943, without previous naval or air bombardment, the leading waves stepped ashore on the sandy beaches near ancient Paestum. The Italian surrender had been announced only the night before. Unwarranted optimism was soon reduced as the Germans in waiting faced the invaders. Shoved back from the beaches, the enemy thrust powerfully at Altavilla and along the Sele River. Casualties were heavy. Airborne reinforcments arrived from Sicily at the height of the battle. A new line was formed, and on September 14 the enemy's heaviest blows were warded off. The beachhead was secure. INVADING TROOPS faced imposing Mount Soprano. In the plain below were olive orchards, orange groves and well-cultivated fields. The ancient Greek Temple of Neptune at Paestum (lower right) marked the only settlement on the plain. Frank Duncan, the artist, was a member of the 36th Division and sketched many of its battle scenes.